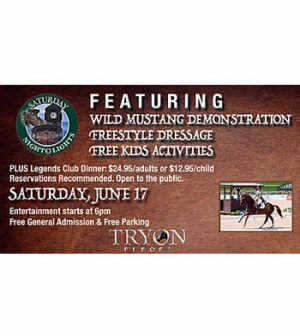 Mill Spring, NC – June 15, 2017 – Before this week’s “Saturday Night Lights” free family entertainment and Freestyle Dressage competition at Tryon International Equestrian Center (TIEC), be sure to catch the wild mustang demonstration presented by the Mustang Leadership Partners at 6:00 p.m. in the George H. Morris Arena. For added value, watch the show from the comfort of the Legends Club patio overlooking the George Morris Arena as you dine on a gourmet buffet or visit one of Tryon Resort’s many other dining options. The mustang, long an American icon, faces a serious overpopulation problem. As of 2015, more than 47,000 wild horses and burros were living in off-range corrals due to a population that was more than twice what Bureau of Land Management (BLM) Herd Management Areas could sustain. The BLM can no longer afford to gather as many wild horses and burros from public lands, since there are still so many waiting to be adopted in off-range facilities. Currently, only the amount of horses that will be adopted are removed each year and kept in captivity, but research and implementation of birth control methods and herd management systems are still in progress, and there are still many wild horses and burros that need homes so that wild populations can remain healthy at the landscape’s carrying capacity. Mustang Leadership Partners (MLP), founded 2010 in Chattanooga, TN, is an after-school program for students at Chattanooga Girls Leadership Academy. It is a mentorship, leadership and STEM program created to bring hands-on experiences that lead to life-long lessons inspired by the wild American mustang. 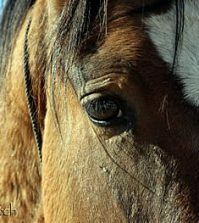 The mission of MLP is to sustain, preserve, and protect the wild American mustang. Students and mustangs will perform in the George H. Morris Arena. Through the MLP program, students have the opportunity to develop, practice, and improve relationship skills, responsibility, social accountability, self-awareness and self-confidence-all of which are mirrored in the mustang’s behavior. Students of Mustang Leadership build lasting bonds with a mustang; the mustang becomes their mentor and their teacher. As a result, students are more confident because they have met and conquered something new and seemingly insurmountable. Don’t miss this chance to witness the magic of connection with an American mustang. For more information about Mustang Leadership Partners, visit their website at www.mustangleadershippartners.com. Watch the Mustang Leadership Partners demonstration and Dressage Freestyle ringside at Legends Club. Tickets are $29.95 for adults and $12.95 for children. Dinner and Dressage is open to the public, but reservations are recommended. For reservations, please contact Legends Club at legendsclub@tryon.com or by calling (828) 863-1130. Parking and general admission is free and open to the public. 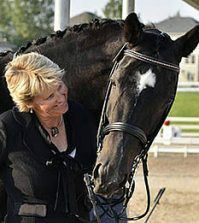 For more information on Tryon International Equestrian Center and Tryon Resort, visit www.tryon.com.